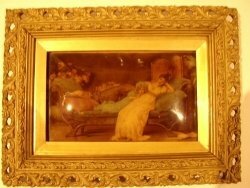 A fine example of a Victorian Chrystoleon in decorative plaster and gilt frame. The Chrystoleon is a tecnique of painting on glass from behind.The glass is curved to give the impression of depth in the scene. 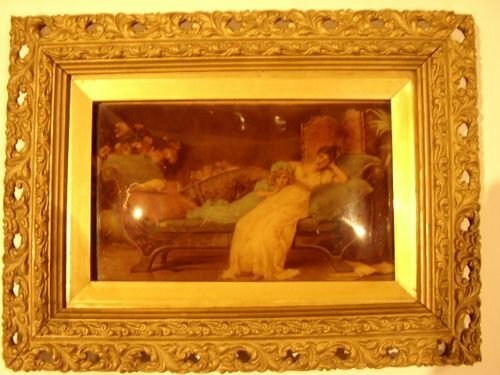 The scene depicts a victorian mother with child reclining on a chaise lounge to comfort her child. The condition is excellent as is the frame. to include the frames overall.This is much larger than most as the majority were minatures. 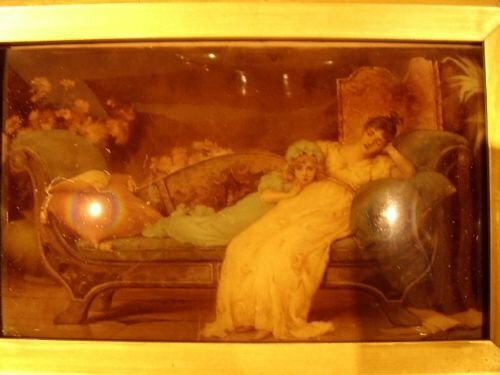 A fine example of an early Victorian Chrystoleon painting on glass.A technique of painting on the back of the glass. The scene is of three maids having in conversation with one opening the window,whilst standing on a chair. The frame is quite special as it has been made with great detail and covered in plaster mis with gilt finish. 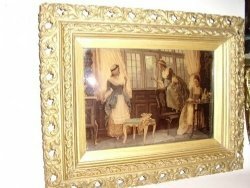 Measurements are 15 Inches x 12 Inches to include the frame overall. Condition is all round very good,bar a tiny slither missing on the top left corner of the frame. TELEPHONE 07765 856171 TP RESERVE. DELIVERY UK MAINLAND/CALL US FOR A QUOTE. A large example of a Victorian Chrystoleon on glass. Framed in a very ornate plaster and gilt,the detail shown is amazing. 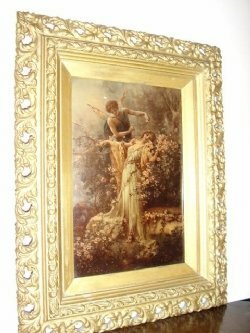 The overall condition is good for the age and the frames are extremely eye catching. The scene depicts a fairey covering a young lady in pink flowers. The Measurements for this large piece are 12 1/2 Inches x 15 1/2 Inches. HOURS 10 AM - 10 PM7 DAYS A WEEK. DELIVERY UK MAINLANDCALL FOR A QUOTE.